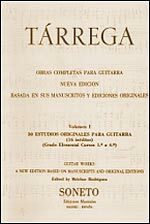 This volume contains 30 ORIGINAL STUDIES for the guitar by F. Tárrega which were composed as lessons for his disciples. Each study was written with a specific pedagogical aim, using different formulas, both technical as well as musical, characteristic of this instrument. These studies will help the guitarist make important progress which will later aid him in overcoming, without fatigue, the problems of new works he must incorporate into his repertory and which use different formulas and are written in different styles. These studies expound upon such important matters as scales, ligatures, barré, etc. on the technical side, and phrasings, articulations, etc., on the interpretative side. The studies, along with those of other composers like D. Aguado, F. Sor, etc., are the basic foundations and essential complements to an adequate work program for the guitarist.